Like the proverbial London buses, no sooner do we report one new order than news of another arrives - a 37.86m yacht to be built by Palumbo. The order is for a Columbus 125' Hybrid designed by Sergio Cutolo from Hydro Tec. She will have three decks and large interior volume, sleeping 8 guests in four cabins. Her full displacement hull and superstructure will be constructed in aluminium to keep her weight down and increase fuel consumption, and she will be fitted with an optional eco-friendly diesel electric hybrid propulsion system. She will have a range of over 5,000nm. 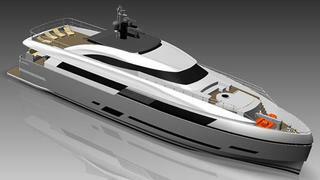 Construction is due to start at Palumbo's yard in Naples in the near future with delivery scheduled for August 2013. The Russian buyer, represented by Jimmy Broddesson from bluewater, also has an option on a second hull of the same type and specification.